The travel guide industry is moving in an interesting direction this year, with a focus on mobile, professional content and images. According to Google, over 50% of business travelers use mobile devices to get travel information in 2011. The internet giant itself bought established travel guidebook Frommer’s last August to supplement its service Google+Local with professional reviews of hotels and restaurants. There is a new travel guide that utilizes the power of mobile and combines it with the popularity of bookmarking pictures: Everplaces. 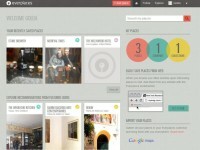 Everplaces is a “Pinterest” purely for mobile destinations. Users can bookmark or favorite tips, content, services at any given destination and share the content with others, who can also add information. You can add photos from your mobile device and the application will automatically detect the location where the images were taken. Another great feature of Everplaces is the ability to build lists as your own customized travel guide. On your home page, Everplaces displays recommendations from featured users. Based on your own pictures, the app will recommend other places and pictures. Of course here comes the challenge: will these results be relevant? Perhaps not, but there is no doubt that Everplaces is a beautiful and fun way to keep track of popular places. You can also import your “Places” from Google Maps into your Everplaces collection. There is also a bookmarklet you can add to your browser tab so that you can instantly add a place when you stumble upon it while browsing. Everplaces has managed to capture users in over 90 countries around the world in just six months. While it is true that recommendations from Everplaces may not be as valuable as the professional reviews on Google+ Local, they do have the potential to share space in the travel industry with user-generated guides like Foursquare, TripAdvisor and Yelp. Have you tried Everplaces yet? Feel free to share your thoughts in the comments below!